your property. Critter Control® has established itself as a premier wildlife management company in the West Palm Beach area through our use of effective and humane removal techniques that keep your property opossum-free while protecting wildlife simultaneously. With a mouth full of teeth and a prehensile tail that allows them to grasp branches and other surfaces, opossums are both agile and destructive. They often find their way onto properties in search of food and water, and will rummage through garbage cans much like raccoons do. This behavior combined with their willingness to take up residence in garages, sheds, attics, or in crawlspaces are good reasons to call a professional opossum removal service like Critter Control® of West Palm Beach. 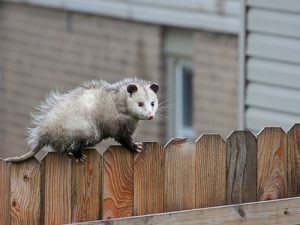 Opossums are adept at eating everything from wild rodents, insects, and other nuisances, but this often leads to the destruction of gardens, flowerbeds, or the overturning of garbage cans. To discourage opossum activity on your property, be sure to keep any potential food sources like pet food bowls or garbage cans stored inside. If these measures aren’t enough to prevent opossum activity, consider calling a specialist at 561-274-0224. We constantly set ourselves apart from the competition through our commitment to not only resolving your wildlife issues, but doing so in a humane way. Additionally, we painstakingly clean up any messes the opossums caused, and professionally repair any damage left in their wake. To learn more about our opossum removal services or to schedule a consultation, call us today at 561-274-0224. Bat Extermination is Illegal. Know Your Removal Options.